Although the Games will be going on during the week of the 6th to 15th of July, the big day will be Sunday July 15th. We hope that there will be something for everyone at the Leisure Centre that day, with various competitions and ‘Have-a-go-Sessions’ going on for most of the day. 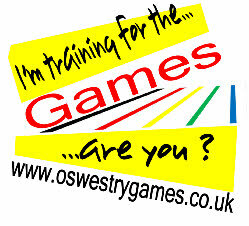 The day will start at 9.00am with a Swimming Gala held by the Oswestry Otters Swimmimg Club. There’s a 10k Road Race starting at 1.00pm at the Cattle Market across the road, the race will head off towards Weston and come back to finish at the Pedigree. During the afternoon there will be Basketball, and hopefully Wheelchair Basketball, a Fencing competition with some demonstration fights too. There will be top class table tennis, Kempo Karate, and a Fun Run of 2012 metres around the College field. The British Mini Golf Association will bring a portable Golf course for some ‘Have-a-go’ sessions following their ‘Pro-Am’ competition the day before in Cae Glas Park. Shropshire Paddlesport will be running some Kayaking sessions in the pool during the afternoon, bring your swimming gear! The paddlers will also be bringing some Ergo Trainers where you can practice your technique on dry land. The Croesoswallt Archers are setting up a range where you will be able to try your hand at Archery. We are working on getting a 6 metre climbing wall for the afternoon. The Oswestry Boys & Girls Club are holding a ‘Going For Gold’ skills week at their club in Park Hall and their Final will be on Sunday morning. Elite Martial Arts are holding an ‘Open Mat’ Grappling session, Ballsports are bringing their Radar Goal equipment to test you penalty kicking skills, Kempo Karate are setting up a piece of kit which can measure the speed of your punch and Oswestry Arrows Basketball Club will be offering a ‘Shoot The Hoop’ session. If you are lucky enough to win a medal at the Oswestry Games, you will be able to get it professionally engraved with you name and event. Also at our closing day there will be an interesting opportunity for some sports physiological testing undertaken by ‘The Lab’ of Oswestry....How fit are you? We will also have a set-up where you can practice your racquet skills. Plus..........a Yoga class, a Zumbathon, Zorbing for kids, practice your golf swing and have a go at making an Olympic peg doll with the Qube. To finish the day off, the fabulous Porthywaen Silver Band will play and the Oswestry Games Community choir (they’re very good!) 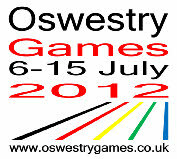 will sing the Games anthem, which has been especially composed and arranged for us by Julian Cattley of Oswestry School. And to close, we will salute all those who have won medals at the Games during to week with a huge cheer! What a day - Don’t miss it!